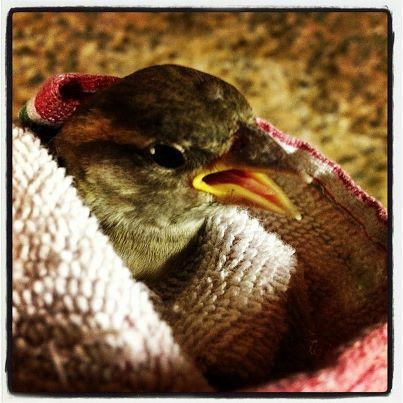 Cradled in my 6yo daughter’s hands was a sparrow. Lately it seems as though we are living an episode of Alfred Hitchcock proportions as little sparrows flock into our Florida room. The recipe for sparrow attraction seems to be a combination of Purina Puppy Chow and little children who will not close the door as they run in and out. I wish I could tell you that no bird was harmed in the making of this blog post, but they tend to not be not real bright when it comes to distinguishing glass openings with real openings. The children are all little miniature Jeff Corwins when it comes to animals around the house. There is a steady stream of frogs, turtles, lizards, birds and the occasional neighborhood mutt hiding in our garage. Some have been injured in the “only the strong survive” way of nature and some don’t have enough sense to stay out of the house. The bird being offered to me has never been exposed to the Windex commercials alerting fowl to the dangers of clear glass. It was a little loopy and I was unsure of how badly it might be injured. I thought perhaps giving it a little water to drink might make it feel better and it might give me an idea to how extensive the injuries were. Taking a small medicine cup filled with water, I proceeded to flip it slightly to dip its beak a little closer to the offering. *Public Service Announcement* Water will immediately revive a bird and give it enough strength to dart from your hands, clear across the kitchen to take refuge behind a refrigerator. The dog who believes it his position to defend the house against any and all intruders, and was casually observing the resuscitation efforts will go certifiably nuts at the sight of a winged refugee. Pushing a refrigerator out of the way while preparing to catch a bird in mid-flight, holding back Mr. Canine-Bodyguard with copious amounts of drool streaming from him onto your foot, trying to calm 5 small children who are only there to scream in your ear about how you must catch poor Tweety (who is the best bird ever and everybody’s best friend apparently) is not for the amateur mother. Did I also mention that the lunch on the stove now has a bird wing floating in it from our daredevil bird bomber? Bird Flu Stew – awesome. I am happy to report that poor Tweety was eventually captured and released back into the wild blue yonder, which is so much better than hunched behind my fridge trying to escape the slobbery clutches of certain canine consumption. Every day in a million little ways, some kind of “crazy” flies into our lives. Sometimes we just “wing” it and go with it. Sometimes we have to hunt it down and release it back. Some nights after all the beasts have been tended and I’ve announced bedtime for the 64,587th time; it’s all I can do to not just pass out from the sheer exhaustion of keeping “crazy” to a minimum. Many times I have told my husband that I only married him for the writing material. Mostly though I survey the day’s damage and count myself and Tweety lucky to have survived.